It’s amazing to watch how rapidly the Agera RS accelerates from 186 mph to 249 mph while remaining so stable. Over a month has now passed since the Koenigsegg Agera RS broke five production car speed records on a closed section of public road in Nevada. Records which probably won’t be beaten for some time – at least not until the Bugatti Chiron and Hennessey Venom F5 have a go. A new on-board video shot from a GoPro camera inside the hypercar has been shared by Koenigsegg giving us a front seat view of the record-breaking 284 mph run in the Agera RS from the perspective of factory driver Niklas Lilja. As a blog post by Koenigsegg explains, Lilja was slow off the line because the objective was to set a record for top speed, rather than fastest acceleration. Instead, Lilja accelerated smoothly to avoid putting too much strain on the 5.0-liter V8 engine, since it was going to be at the redline for a long time while the hypercar was pushed to its limit. Koenigsegg also had plenty of road to work with, so it didn’t make sense to accelerate hard in the early stages of the run and apply unnecessary stress to the engine. Lilja didn’t even hit full throttle until the Agera RS reached 186 mph. Applying full power, it’s amazing to watch how fast the Agera RS rapidly accelerates from 186 mph to 249 mph. 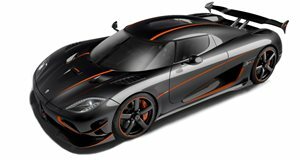 “We were very pleased with the stability of the car at speed,” Koenigsegg wrote. “This is a public road, not a silky smooth track. The Agera RS remained very stable even at the highest speeds. Niklas only had to control the car. He never had to fight it.” At the fastest section of the run, Niklas was covering just over 416 feet (127 meters) per second according to Koenigsegg. At those speeds there was no margin for error at on such a dangerously narrow road. If you need a reminder, here’s a recap of all the records the Koenigsegg Agera RS has set. Its average top speed was 277.87 mph, and it also beat the Bugatti Chiron’s 0-249-0 mph record in 33.29 seconds. It also set the highest average speed for a flying kilometre on a public road at 276.6 mph, a flying mile on a public road at 247.36 mph, and the overall highest speed reached on a public road at 284.55 mph.